Dream vacation far away from tourism in Damouchari Pelion Greece. In order to enjoy a relaxing holiday far from the beaten track, the charming place Damouchari offers perfect conditions for it. The forested mountain Pelion, which is situated on the east coast of mainland Greece, is the perfect spot for those who seek hiking or relaxing holidays. Anyone who has seen the successful musical film “Mamma Mia!” , will have probably wondered where can be found nowadays such a primitive Greece. In fact, the film was shot in Skiathos, Skopelos and Damouchari. The crystal-clear, turquoise sea, surrounded by an impressive mountainous landscape, undiscovered beaches with little traffic is everyday life for the inhabitants of Damouchari. The settlement is located on the east coast , almost exactly halfway between Athens and Thessaloniki. The closest town “Volos” is located about 48 kilometers from Damouchari. Volos is also the capital of the region and is often referred as the gateway to Pelion. The romantic place Damouchari consists of two bays , where you can choose from a sand and a pebble beach. You will also find in this hamlet two small grocery stores, as well as five taverns. The houses in the settlement are all built in the traditional Pelion style. Charming is also the natural harbor of Damouchari. Would you like to get to know Greece in its original form, then you are exactly right in Damouchari! The houses are built in a 9,000 square meter property surrounded by olive trees and consist of three buildings. Each building has 4 studios (two upstairs and two on the ground floor). All are equally modern and tastefully furnished and offer a relaxing holiday. They are situated practically in the middle of nature between mountain and sea, between heaven and earth. The studios have a lovely living room with a fireplace, shower / WC, a properly equipped kitchenette, a double bed and a sofa bed, which also is suitable for a third adult or for 2 children. The studios also have air conditioning, Wi-Fi internet access, TV, balcony with garden furniture and view at the Aegean sea. Cleaning: Every three days cleaning and towel / linen change. Shopping: Taverns and a mini market can be found in the area. More shopping and entertainment are located in about 4 km in Agios Ioannis. Beach: 40 m below the house is the beautiful beach of Damouchari. More beaches and coves are found within a radius of 4 km. 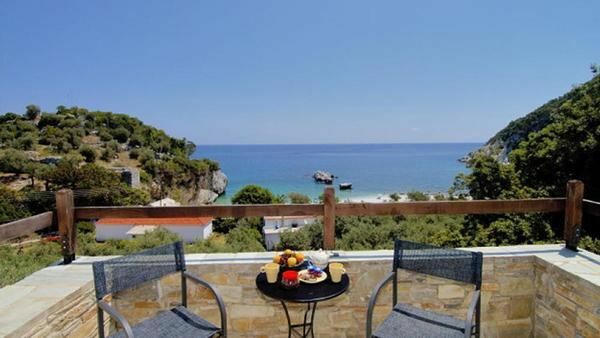 Guesthouse Damouchari is located at the foot of the village Mouresi, 48 km from Volos. The road meanders through the bright green slopes of Mount Pelion, land of the mythical Centaurs and Argonauts. Along the route one passes several well-known and scenic villages, such as Portaria, Makrinitsa and Chania. You get acquainted immediately with the beautiful nature and every time a magnificent, panoramic view towards the Aegean Sea pops up!